Paid membership websites have become popular as a vehicle for the easy delivery of products and services. 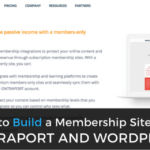 Having a paid membership site is a great way to earn regular income by sharing specialized content to those willing to pay for it, while also gating it from people that might otherwise try to steal it. With the right system in place, membership sites aren’t difficult to setup and maintain. The main challenge? Creating compelling subscription tiers for an optimal return on the investment of your time in creating content. Not all membership tiers need to require payment. Offering a free tier on your subscription site empowers you to test out new content and infrastructure upgrades. Customer testimonials from your free access group can serve as social proof to help sell the other tiers (especially if the site is still new). Offering a free option can help potential customers overcome any hesitation, by giving them the chance to build a relationship and trust with you before actually being sold anything. After all, free members are potential future customers, and may eventually decide to upgrade their access to a paid subscription tier. Finding the right pricing structure for your paid membership website is a process that requires testing. Offering different subscription tiers allows you to test pricing without losing sales through the use of price bracketing. A person might not be able to justify purchasing your all-access subscription tier, but it would be easier for them to find a way to consume your content if they’re presented with multiple options that fit their needs and budget. After getting access to your lowest subscription tier, people might realize the need for a little more information or hand-holding (like consulting), which can turn into additional income streams for you. People appreciate having choices, but they prefer these choices to be limited and curated. Take for example a study conducted by Sheena Iyengar and Mark Lepper, who offered customers a sampling of jam from either 6 and 24 different jars. They found that 30% of customers who tried a sample from the selection of six different jams ended up buying a jar of jam. In contrast, only 3% of shoppers who tried from the selection of twenty-four jams were compelled to make a purchase. Too many choices can be overwhelming, but having a limited number of options helps people to make a purchasing decision. In The $100 Startup, author and entrepreneur Chris Guillebeau discusses the idea that you have to present more than one price for your offer to attain optimum profitability. Your offers may contain similar elements, but people are attracted to a “premium” model. Instead of defaulting to the basic option, many will go for the next best model, so make sure to create a compelling offer for your “next best” tier after a free or basic offering. 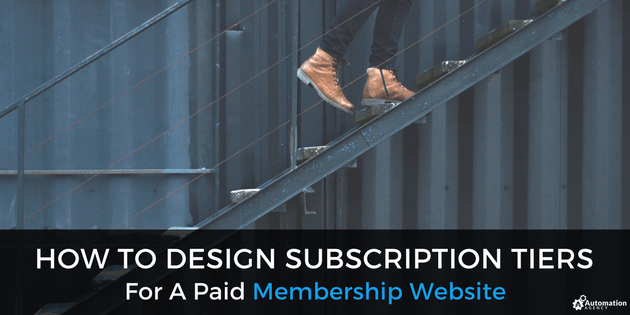 Still not convinced that your paid membership website could benefit from multiple subscription tiers? Guillebeau further explains that offering multiple plans also changes the question from: Would you like to buy *this item* from us? to Which of these items would you like to buy? It’s a powerful distinction for encouraging purchases. Don’t just throw up some subscription tiers without providing a high-level explanation to guide customers to their ideal fit. Try giving your tiers descriptive names, like silver, gold, and platinum. Or, take inspiration from a company like Mailchimp, who has pricing tiers with a naming mechanism of New, Growing, and Pro. Don’t give your pricing tiers boring and description-less names like Option 1, 2 or 3, but also don’t go over the top with names like “Super Cool Plan” or “Super Cool Awesome Plan”. Try thinking like your customer—what would make the most sense to them? If you need more inspiration, try these suggestions and words associated with a basic, standard and premium plan. Three pricing tiers is a good place to start, giving you enough room to offer a free plan, standard plan, and premium plan. Pricing can be tricky. Generally, companies price their products or services based on the benefits the customer will get. However, with subscription sites, that figure can be difficult to determine, as you’re charging a recurring fee instead of something one-time. Start with a survey or market study of your potential customers and create customer personas. Using this data, do some market testing to determine how people react to your proposed prices. If you need some inspiration, KISSmetrics put together a list of pricing strategies well-known subscription websites have effectively used to build their businesses. By determining your customer personas, you can make it easier for people to be “funneled into” a certain pricing tier, since individuals assign value to things differently. According to Guillebeau, people may want the premium plan, but will “settle” for the standard plan. A study by William Poundstone supported this statement and showed that people often want the premium product, but will content themselves with something in the middle. Make sure that your tiers reflect and cater to this finding. If you’re ready to build your own subscription site and are having trouble with the technical stuff, work with a partner who can free up more time for you to focus on content creation. Automation Agency specializes in helping clients develop paid membership websites, with expertise in a number of related platforms. Ready to get started? Pick a plan that fits your current needs, and start sending over tasks to your outsourced team of experts!